When you have natural hair, it can feel like every mainstream hair care product is against you. Shampoos that promise luscious locks often leave your hair looking frizzy, and damaged. Many people with natural hair are left blaming themselves, and their own hair, for constant bad hair days, and many African Americans are left with no other choice than to chemically manipulate their hair. The obvious truth is: It is NOT your fault! Natural hair requires specific care, and products. And despite what your local supermarket will lead you to believe, there are plenty of natural hair care products out there! If you’re tired of your natural hair frizzing out, or looking undefined, then it’s time to give your hair the care it desperately craves. That you could have endless good hair days? With the right shampoo for your natural hair, seriously gorgeous textured hair will become your everyday normal. Below are important hair care tips for natural hair, and our list of the best shampoos for natural hair. If you have natural hair, this is the place to start. 1. Avoid sulfates, and say goodbye to frizz! Afro-textured hair has a very different structure than straight hair. Because of this difference in structure, the hair cuticle (or outer layer of a strand of hair) is fragile. If your cuticle is well looked after, your hair will curl, coil, or kink (depending on how tight your curl pattern is), and it won’t frizz out. Here’s a truth people often miss: Frizzy hair is just thirsty hair. The biggest culprit for frizzing out your hair and drying it out? Sulfates in shampoos. Most shampoos are loaded with sulfates, an ingredient that – yes – cleanses, but also strips you of all your natural oils. Sulfates are a big no-no for textured, natural hair. Check your products’ ingredients list carefully for sulfates. You can find a list of sulfate ingredients here. Avoid sulfates, and you’ll avoid frizz. 2. Say no to silicones, and you’ll never get limp locks again! Natural hair is also easy to weigh down. All those fine coils, kinks, and curls can get easily bogged down with product. You know one of the biggest causes of limp natural hair? Silicones are often used in conditioners, and styling products. They’re the ingredient that actively add ‘shine’ to your hair by basically coating it in a non-soluble silicone. Silicones can’t be washed out of your hair. Not without sulfates. See how easy it is to get stuck in a vicious cycle of dryness and build up when you have textured hair? Avoid product build up by avoiding silicones altogether. Again, here’s an ingredient list to help with your shopping. 3. Step away from the brush! You should never – ever – brush your hair when it’s dry. Have you noticed that when you brush your textured hair – that it ends up looking like a bunch of cotton candy? Sure, if you love the frizzy pouf look – then all the power to you. But if you want defined, shining natural hair, you need to stop brushing it out! What to do instead for your tangles? Comb your natural hair with a wide-toothed comb to detangle it. And only when it’s sopping wet (like in the shower). Use plenty of conditioner to help slick things up. You shouldn’t be in pain when tugging at your knots! If you’ve been using a brush until now, just eliminating this one thing could stop your frizz outs completely! 4. The Curly Girl method will give you the dream hair you’ve always wanted. The Curly Girl method was made popular by Loraine Massey, a curly girl with natural hair who felt pressured to straighten it. She knew that with the right care, her natural hair would fully realize its own fabulous, healthy, curly self – and she popularized the CG method via her book, ‘Curly Girl: The Handbook’. So, what is the Curly Girl method? Cleanse less! If your hair is super coily, you should shampoo as little as possible. Try using a co-wash (conditioning cleanser) for in-between washes! Condition your hair thoroughly, in sections. Boost moisture retention by wrapping your head and applying heat for 15 minutes before rinsing. Scrunch your hair to remove excess moisture. Do so with a T-shirt – NEVER a towel. (Towels are way too drying) Then air dry for the best results! The biggest takeaway here is that textured hair needs lots of moisture, so you want to strip your moisture less often (avoid over shampooing), condition your hair more thoroughly, and never use a towel or hair dryer! The next step is to choose the right shampoo. To avoid stripping your hair of all the oil it needs, try using a moisturizing shampoo chock full of cleansing oils, instead! The HASK Macadamia Oil Moisturizing Shampoo is a sulfate and paraben free ‘poo, specially formulated to cleanse, without drying, and restore shine and bounce to your textured locks. Keep your fragile texture in check with a shampoo that moisturizes. HASK’s Macadamia Oil shampoo will do just that. Formulated with a range of exotic oils, HASK’s moisturizing shampoo will hydrate your hair, and seal it in. Have you ever used a moisturizing hair product only to find that your hair was totally weighed down? Although your hair needs lots of hydration, if it’s particularly fine, it’s going to be dragged down by heavy moisturizing products. If you have fine, textured hair, avoid thick, creamy, oily hair products – and opt for light hydration. 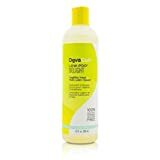 DevaCurl’s Low-Poo DeLIGHT is a shampoo specifically designed for natural cuties who are easily weighed down. This shampoo hydrates, but with the chia-flaxseed extract; an active ingredient with humectant properties – helping to lock in the moisture your natural locks need, without overdoing it. Then you need some Jamaican Black Castor Oil in your life. Jamaican Black Castor Oil is one of those natural hair super ingredients that seems to do it all. 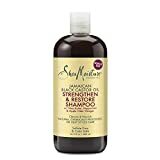 From defining texture, to growing your hair faster, and stronger, no matter what it is you need – this Jamaican Black Castor Oil Moisturizing Shampoo should be in your shower caddy. Have we convinced you yet that Jamaican Black Castor Oil is a super ingredient for natural hair? This SheaMoisture Jamaican Black Castor Oil Shampoo will strengthen, and restore your damaged, dull curls, coils, and kinks – and breathe life back into your natural ‘do. SheaMoisture’s formulas are made with natural, herbal ingredients – and their recipes date back to early 20th century Sierra Leone. Besides the black castor oil, this shampoo is chock full of natural hair lovin’ active ingredients like aloe juice (a great, lightweight moisturizer), and rice proteins (to help strengthen your hair from the inside out). If your natural hair is having a hard time reaching its full potential, this shampoo will help to reinvigorate it; giving it the second chance your hair needs! Increase volume, and fight an oily scalp, with a clarifying shampoo! When you live the low-poo life, sometimes you end up with a lot of build up, even when you’re avoiding silicones. Styling products, and the sebum your scalp naturally pumps out day by day, can layer thick on your scalp, flattening your roots, and making you look more like a wet labrador than a pampered poodle. Sulfates may be the most common clarifying ingredient – but there are way more natural, healthier ways of getting your clarifying fix. The Elucence Volume Clarifying Shampoo will cut right to the root of the problem. Using natural herbal extracts, sage, and willow bark, this shampoo will remove toxin, mineral, and oil build up at the scalp – without using harsh chemicals to do so. This shampoo will further volumize your natural hair, by adding lift at the scalp, where salicylic acid will help to exfoliate your skin cells, rejuvenating your roots and getting rid of dead skin. Added wheat proteins and biotin make this shampoo a god send for anyone looking to pump up the volume on their natural ‘do. Say bye-bye to a flat head, and hello to fabulously bouncy curls. Does anything sound fresher than a combo of peppermint and tea tree? 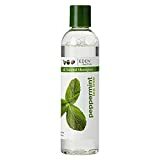 If you want not only a detoxed scalp but a refreshing tingling sensation, then EDEN BodyWorks’ Peppermint Tea Tree Shampoo is for you. The combination of peppermint and tea tree natural extracts will help reinvigorate your hair at the roots, by improving circulation in the skin cells on your scalp. If you have the oh-so-annoying doubled up issue of oily build up, and dry flakey dandruff – then this shampoo will help solve both of your problems. Tea tree is an antibacterial, and will help fight dandruff’s ‘root’ causes (pun intended). Whilst peppermint will help cleanse you of any oils and build up, without leaving you stripped and dry. If anything, get this shampoo for the smell. The peppermint and tea tree scent will perk you up on even the most dreary of mornings. What if we told you, that you could wash your hair with conditioner? Well, it isn’t. In fact, many natural haired cuties forgo shampoos altogether and wash their hair with something called co-wash.
“What’s a co-wash?” We hear you ask. It’s a conditioning cleanser that you can use in place of a shampoo. Unlike a shampoo, co-wash doesn’t have any harsh cleansing agents. And much like a conditioner, it introduces plenty of moisture to your thirsty curls. A co-wash can help to gently cleanse your scalp, without drying it out. If you suffer from frizz, no matter what ‘poo you use, go no-poo! With a co-wash.
Natural hair needs a lot of care when it comes to wash day. You’ve got to not only cleanse your hair, but there’s no use applying shampoo when your hair’s super tangled. Cleansing conditioners are fantastic for co-washing. This SASHAPURE Re-Hydrating Cleansing Conditioner acts more like a detangling cream when applied to wet hair. Enabling you to work through all your knots. This cleansing conditioner won’t foam; helping you cleanse your hair gently, without stripping any natural oils or color. The secret to the mega hydrating qualities of this cleansing conditioner? Organic Peruvian Sacha Inchi oil. It’s chock full of Omegas, and Vitamins (through A to E) – all vital nutrients for healthy, happy, hydrated, natural hair. If you’re looking to say goodbye to dry, dull, frizz – then this could be the co-wash holy grail item for you! This concentrated, hydrating cleansing conditioner will rid your scalp of oil and mineral build-up, whilst giving your locks a dose of lightweight moisture. When you have natural hair, moisture at every step of your hair care routine is kind of a must. As made obvious by the brand name, this Daily Fix Cleansing Conditioner is designed for curlies and naturals, alike. With hydrolyzed oat protein, this cleansing conditioner will strengthen your hair and lift it at the roots. Herbal extracts of chamomile and nettle will detoxify your scalp, but in the gentlest way possible. This cleansing conditioner is gentle enough to use daily (if you have to wash that often), and is guaranteed to not dry your hair out. But not just ANY dry shampoo. Although there are plenty of dry shampoos in the hair care aisle, a lot of them are designed for straight hair – and will either flatten your curls, or do nothing for them. Avoid the harsh chemicals of mainstream dry shampoo, and use one of these – specially designed for curls, coils, and kinks! You’re probably familiar with Batiste Dry Shampoo. It’s one of the best, and with good reason. Both naturals, and straight haired people get the bounce and refreshment they need from a good ol’ spray of Batiste original – and if you’re the type that needs to freshen up between washes, then you will too! This starch based, gentle formula only needs a few sprays at the scalp to help lift your hair at the roots, and re-define your texture. If you’re the kind of curly to work out at the gym, or spend long hours away from home, then a Batiste in your bag is a must-have. 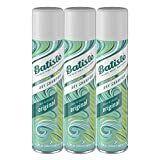 Batiste helps to keep your hair clean when you’re on the go, when sprayed at the roots it works hard to absorb oils and grease, and to give your locks a clean, fresh scent. No one needs to know it’s been days since you last washed! Or that you’ve just come to the party straight from the gym! Smell great, and look great, with the Batiste dry shampoo that’s been long-loved, and praised. But the DevaCurl No-Poo Quick Cleanser promises to deliver lustre and shine to your hair without any visible ‘stuff’ along your roots and hairline. This invigorating spray is designed for wavies, and curlies, alike – making it a dry shampoo specifically designed for your natural hair. This dry shampoo has no harsh sulfates or chemicals, and instead refreshes your hair with peppermint, rosemary and hops. Natural hair loves natural ingredients! For the backpacking, traveling, or waste free natural: Shampoo Bars! If either of these issues have stopped you from committing to any of the above shampoo options, then a shampoo bar is for you. Not some venue where you can drink shampoo, that’s for sure. (Sorry, couldn’t resist that word play). A shampoo bar is much like a soap bar; it’s a shampoo that’s condensed into a block of soap, essentially. But it’s for your hair! And unlike most commercial soaps, these shampoo bars we’re about to share with you are perfect for natural hair. So they won’t dry you out and puff you up! Is your textured hair forever yearning for hydration? Give your curls/coils/kinks all the creamy moisture they need with this OBIA Naturals Coconut Shea Shampoo Bar. Both coconut and shea are super thick, hydrating ingredients – guaranteed to clean you up without drying you out. Also, our favorite ingredient castor oil is part of this bar’s formula. Meaning it’ll also support your hair by strengthening it, and encouraging it to grow! Making it the perfect shampoo bar for curlies looking to minimize waste, and animal cruelty. Sometimes a soap bar can double as a shampoo bar! Especially when it’s made with a gentle cleanser like castile. You’re probably familiar with Dr. Bronner’s castile soaps – and might even already use it at home on your body, face, and even on the dishes! This castile soap bar is so versatile that it makes the perfect addition to any minimalist home. Castile soap is a lot gentler than other common, commercial cleansing agents – and as such, is safe to use on natural hair. We’ve included this peppermint soap bar for the curlies who need a more detoxifying and clarifying shampoo bar in their lives. If you have an oily scalp, castile soap will sort you right out! But having said that, if you suffer from a dry scalp, you probably want to steer clear of Dr. Bronner’s! The peppermint in this soap bar will leave you feeling tingly, and super refreshed. Bad hair days may be inevitable, but they’re not your natural state. Your hair just has needs that aren’t being met. The shampoo options we have listed above have all of these needs in mind; as they’re specially designed, and loved by, natural cuties all over the world. Show your hair some love. And your hair will love you right back. We can’t wait to see you caring for your natural hair, and looking amazing because of it!